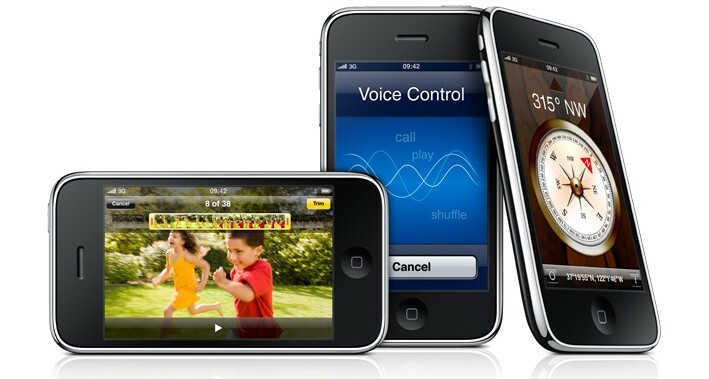 The Apple iPhone 3GS is the fastest and most powerful yet. It is the best mobile phone on the market with a variety of impressive and useful applications. The iPhone is much more than a mobile phone. It allows, internet tethering, so that you can use it to get a 3G, connection on your PC or Mac. Web pages and attachments can be viewed quickly while you are on the move and the 3D graphics will offer you an amazing gaming experience. However, you are constricted by the ability to only play games that involve the touchscreen or the accelerometer to detect movement. The iPhone 3GS is faster and more responsive than the previous iPhone 3G. You can record, video, edit and share your videos by email to your MobileMe Gallery, publish them on, YouTube, or sync them to your Mac. You can multitask, you can be downloading email and files while web-surfing or composing text messages. At present O2’s offers are cheaper than Orange saving you £15 approx. on similar pay-as-you-go deals for handsets around £449 for 3GS 16MB and £549 for 3GS 32GB. Alternatively try Amazon website for a competitive PAYG deal. The Apple Iphone can change the way you can work with colleagues, socialise with your friends, purchase goods and interact with both organisations and objects in the environment. It could change the dynamics of how you now live in that it enables you to carry out business activities at anytime and anywhere. To feel good about yourself get an Apple iPhone. Once you have aquired your iPhone (with or without a network contract) you can get free and paid for applications that are great for saving money. 1. Redlaser (£1.19) lets you scan barcodes and search online for lower prices using Google product search and Amazon online. 2. PetrolPrice Pro (£4.99) will give you cheaper fuel options within a 5,10,15 or 20 mile radius of where you are. 3. Meter Readings (59p) tracks energy and water use in your home by day, week or month (as line graphs); knowing/altering your consumption habits can help you save money. 4. Tipulator (£1.19) Useful for restaurant tipping; enter bill amount, select percentage and number of people tip is being split by and the numbers are crunched for you. Which Magazine (March 2010) have recently reviewed and rated satnav apps and found that the highest scoring best app was iPhone with TomTom (app £60, car kit £100). These prices don’t include the phone of course and for customers who have already purchased V1.0, upgrade to V1.2 is free of charge. Smartphone satnav apps can usually only be used on one brand of smartphone. For example, the TomTom app is specific to the iPhone. The kit has a GPS receiver to enhance the signal and charge your iPhone as you travel and this significantly improves the app’s performance. The separate speaker improves the sound quality so that there is no distortion at higher volumes. This version also has great features such as spoken road names, advanced lane guidance and a help menu. It also has an updated map and camera database. The iPhone’s screen has a 12.9 aspect ratio offering a clear route display and the screen adjusts according to its orientation. The TomTom cradle allows for this adjustment without removing from your car windscreen. Downsides are the small icons make it more difficult to programme compared to a dedicated satnav and the schematics are small compared with most standalones. The app also works on iPod touch. Pocket First Aid & CPR £2.39 This is bit like an electronic book rather than an interactive guide as it is complex and rather wordy so don’t rely on it in a panic. You can however gain useful advice on how to dress wounds in an emergency. First Aid Pocket Guide 59p This aid is based upon an Australian paramedics manual. It has big clear icons on the home screen which require two taps to get to information re dozens of emergency situations. It is clearly presented in bullet-pointed texts or checklists. The downside is it only gives US emergency contact numbers. iEmergency ICE Family Pro £1.79 ICE means In Case of Emergency – and this is a British protocol. Family Pro is the most expensive ICE app in the iEmergency series and it allows you to save extensive details on an ulimited number of family and friends. This includes ID photos, blood type, allergies and any medication being taken. Entering this data can be time consuming but details from your contacts list can speed up the process. If you lock your iPhone, key details can be saved as wallpaper which is readable by waking the handset. A free single-user version is also available. Tweetie is a really helpful Twitter app for the iPhone and iPod Touch. This app has all the features that you come to expect out of a Twitter client and does it with such a clean interface. It is a truly brilliant App that really plays to the iPhone’s strengths – a must have have for a follower of Twitter. When you start up the app you’ll need to sign in with one of your Twitter accounts. This app allows for you to register with multiple, so keep that in mind when you’re picking out which Twitter app you’re going to use. After you log in, there are four main buttons and a more button for you to delve through. Those buttons are Tweets, Replies, Messages, and Favorites. “The Twitter client that redefined Twitter clients is back, and it’s even better. Rewritten from the ground up with a fast and powerful new core, Tweetie 2 offers the most polished mobile Twitter experience around. Get Tweetie on the Apple iPhone store. The fashion label Paul Frank have released a number of fun, rubber cases for the iphone and itouch. Priced around £25 the cases add a bit of cartoon fun to the ultra-styled iphone. It allows full functionality, with custom cutouts providing access to all touch controls, headphone jack, dock connector, camera, speaker and the microphone for easy in-case use. 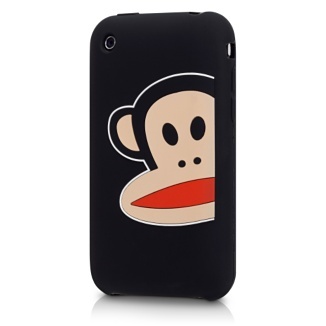 It’s a great way to protect and add the Paul Frank style to your sleek iPhone 3G without extra bulk. Safeguard your iPhone 3G with this form-fitting protective case from Paul Frank. 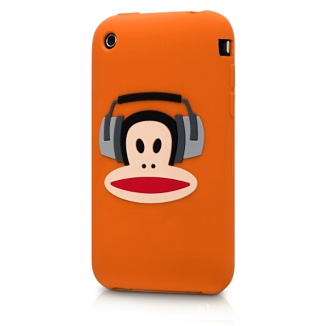 It’s a durable, stylish rubber surround that keeps your iPhone looking as good as new, with a classic Paul Frank design. The popular Metal Gear series from the Playstation has found its way onto the iphone. 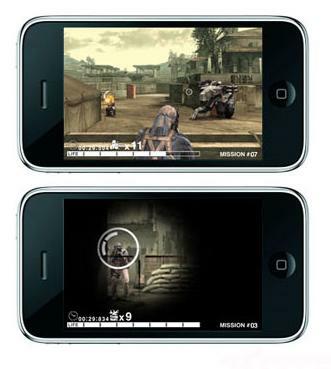 The game play is quite different on iphone – rather than focusing on the storyline of the original, on the iphone the emphasis is on shoot-em up game play. Welcome to iphone pay as you go – this website’s aim to help you find payg (pay as you go) deals for iphones quickly and simply. The website is low on frills but gives you the pricing information you need to help you find the right balance of the cheapest way to purchase an iphone and to make your purchase from a reputable high street retailer on online store. For now here is some simple product information and links to where you can buy the Apple iphone on a pay as you go basis. pay as you go iphone deals on the o2 network are called ” Pay & Go “. You don’t need a contract SIM card instead you get a pay as you go (PAYG) sim and purchase the iphone out-right. Pricing for the o2 iphone direct from i2 is below. You can also buy an iphone on the o2 network from Apple or the Carphone Warehouse. “Pay as you go customers can now enjoy the iPhone 3G without a monthly contract. The new iPhone 3G 8GB for Pay as you go will be available for £349.99 and the 16GB version for £399.99. This also includes unlimited browsing and Wi-Fi for the first 12 months after you activate your iPhone 3G*. At the end of the 12 months you can continue to receive unlimited browsing and Wi-Fi for just £10 per month. We’ll notify you before the end of the 12 month period by text and you can easily unsubscribe if you choose to do so. The iphone is also about to be released on Orange (10th November 2009) and Vodafone. See the special iphone web-page on the Orange website (visit the Orange website further information visit the CarphoneWharehouse website. If you prefer to have your iphone on the Vodafone network then register your interest on the Vodafone website. When the iPhone was launched in 2007 it had 11 apps, including a calendar, calculator and weather reports. In July 2008 Apple opened its App store with 500 apps available. Today there are more than 140,000 apps to choose from. If you have an iPhone you can get free and paid for applications that are really great for helping you to save money. Our website will help you decide where to spend your hard earned dosh and help you economise too. 2. PetrolPrice Pro at £4.99 will give you cheaper fuel options within a 5,10,15 or 20 mile radius of where you are. 3. Meter Readings at only 59p tracks your energy and water use in your home by day, week, or month. It plots them as line graphs. Knowing your consumption habits can help you cut back and save money. 5. Tipulator sells at £1.19 and can be useful for restaurant tipping – you enter the bill amount, select the percentage you want and the number in your group to split with and the sum is number crunched for you. Please let us know which apps you think are wise buys.